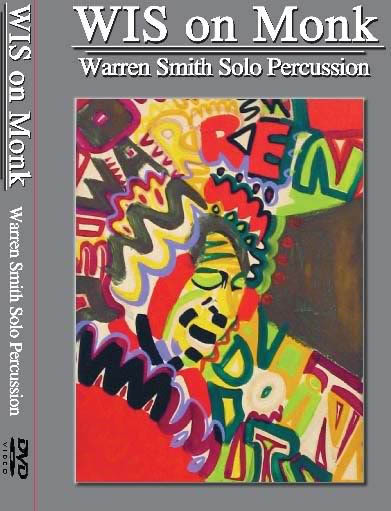 Warren Smith explores the music of Theolonious Monk through solo arrangements on percussion. He also includes live footage of his concerts from his Jazz Loft in NYC. To say Warren Smith has broad experience as a percussionist would be quite the understatement. His ability to play ALL percussion instruments in any musical style—jazz, Motown, Broadway, classical, rock and pop— makes the Chicago-born Smith one of music’s most valuable players. A list of the artists he’s worked with would be endless. WIS on Monk is therefore an important and welcome document, providing a glimpse into Smith’s personality as well as his virtuosity, particularly on marimba, vibraphone and timpani. The DVD starts with a solo marimba version of “Monk’s Mood.” The rich wood tones of the marimba’s keys are well recorded (by Ed Montgomery) and visually it’s fascinating to see what this uncommon instrument looks like and how it is played. Yet, the aesthetically compelling elements of this DVD are not limited to the exotic instruments; on “Epistrophy” Smith is wearing a colorful, bird-like facemask! Indeed, “Light Blue” (on vibraphone) and “Epistrophy” (on marimba and timpani) also feature striking visual effects. Monk’s melodies are so strong that you recognize them even when they are played on woodblocks or tom- toms, and as much as this is a unique take on the pianist’s melodies, harmonies and rhythms, it’s also a revelation of Smith’s sense of dignity, humor and theater. Though the DVD is not divided into parts per se, there are two different time periods represented: the Monk music recorded in 2005 (at Context in Brooklyn) and Smith’s original compositions from 1986-87 (at Studio WIS). The second half of the DVD is also very welcome, both as a document of a unique musician and because it was recorded at Studio WIS, which has long been an important musical laboratory for creative musicians in NYC. Tracks: Monk’s Mood; Brilliant Corners; Ruby My Dear; Epistrophy; Light Blue; Well You Needn’t; Round Midnight; Warren Doin’ It; A Walk With Myself; A Talk With Myself; Kaelin’s First Steps; WIS Whistles the Blues; Conversations with Papa Jo; Blues for the People; High John The Conqueror Root; The Witch Doctor. Personnel: Warren Smith: marimba, vibraphone, timpani, glockenspiel, drum set, gongs and many other percussion instruments.